Assault Against the Menace on the Mountain is a scenario which promises much, but delivers very little. Billed as “a Roman-themed module based on the story The Very Old Folk by the master of pulp horror H.P. Lovecraft”, it sets the player characters against sinister and ancient hillsmen about to perform an evil ritual and destroy a Roman town in the Pyrenees. The characters may be wandering mercenaries, Roman citizens out to protect themselves, or members of the Roman-friendly Vascone tribe, and they are in for a storehouse of horrors as they join a doomed cohort which sets out to prevent a terrible calamity. This is an excellent setup for an adventure, whether it is a wilderness expedition or a dungeon crawl. The product uses public domain art to excellent effect, and it is very professionally laid out in the popular “Moldvay/Cook rulebooks” style: in fact, the author and his editorial assistant have exercised obvious care in making sure the material is approachable, with death trackers and the flowchart for getting lost in the wilderness (which is, on the other hand, very abstract and doesn’t sound too exciting to play), and these devices being explained to the GM very meticulously. 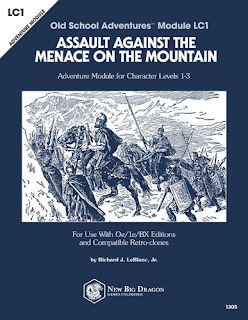 Unfortunately, the adventure is also a major railroad in three acts, and it begins right with one of those basic offences you might think old school publications of all things would have sworn off for good. You do not very often see boxed text written by H. P. Lovecraft, but boxed set it is, and it is used like a blunt, half-page instrument the GM is supposed to read out to his players. Subsequent events add several smaller instances of the same to the module text. This is followed by descriptions of major NPCs and groups of the expedition ranging from lictors to slaves – this part is fine, but then we get to the action, where none of this really matters anymore. And here lies the problem. This module is about a linear sequence of events, which the player characters experience, but can’t meaningfully interact with or influence. There are curious devices like a complex chart with percentages to figure out if certain NPCs are willing to interact with the PCs, and even another chart to figure what they have to say; rules for time and movement; a chart for getting lost if the PCs wander away from the group – but this does not matter at all, and nor do the “clues” which can be gathered along the way. Non-interactive encounter follows non-interactive encounter as the cohort enters the mountains, and members will start to lose their minds and die in great numbers. There is a table called NPC Deaths per Turn, which, indeed, determines how many NPCs will die by NPC category. Fortunately, none of these deaths affect the PCs, and it is advised that the GM should engage in some illusionism by rolling “false” saving throws to “heighten the sense of dread and anticipation”. Unfortunately, having personally experienced these efforts at “tension-building” in other adventures, I am completely sceptical about their usefulness in heightening the sense of dread and anticipation – especially since they are not tied to PC actions in any meaningful way. Finally, everyone who is left arrives at the mountaintop ritual, where “they will be presented with an ethical dilemma.” This dilemma amounts to deciding whether they are willing to let a bunch of ancient tribesmen enacting a blasphemous demon-summoning ritual ( “by engaging in unspeakable acts, mostly of the blasphemous sexual nature”) summon the demon and destroy everything, or “stopping the very old folk from engaging in those acts”. This is bound to be a hard and complex issue indeed, although, honestly, killing all them blasphemous sodomites sounds like a workable plan. It is also way less dangerous than removing the glyphs representing the demonic influence from the cultists and having to kill them afterwards when it turns out they are still fanatically loyal to the demon, which shows us that pacifism is for limp-wristed quiche-eaters. Unfortunately, “the dark man from the altar”, who was leading the ritual, has disappeared (the module states, elegantly wiping away all remaining traces of protaginism) and he will find another tribe to convert to demon worship. The End. I would not recommend this module. I wonder why you spend time un reviewing stuff you find worthless. Maybe to make a point about adventurer design, so as to get less of this stuff in the future? Not meaning to come across as agressive. Just geniune curiosity. I don't deliberately look for badly written adventures - life is too short for that. But if I buy or download something, it is only fair to warn others, just like it is important to point out the good stuff. I believe reviews serve a useful function in a community inundated with products. You can tell many of them are not going to be good on a first glance, but some are harder to tell. In this case, the adventure was promising on an initial look, but turned out to be terrible upon reading.